Throughout history, the Crimean Tatars have faced various challenges. They endured deportation and repression under Stalin, and were allowed to return to Crimea only in 1989. After the collapse of the USSR, they grew into an organized and politically active community, but struggled to find a constitutional agreement with Ukraine over the issue of sovereignty. 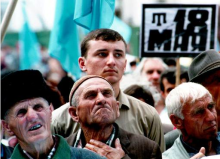 Over the past few weeks, new challenges have emerged: Crimean Tatar representatives were expelled from the premises of the Mejlis, their main self-governing body; their TV channel, ATR, was accused of “extremism” for speaking out against the annexation; libraries were shut down and replaced with Russian institutions. In interviews to the Russian media, the Russian leadership – who refuses to recognize the legitimacy of the Crimean Tatar self-governing institutions – resuscitated the specter of deportation for opponents of the local government with their threatening words. This marks a shift in the strategy followed by Russia immediately after the annexation. At the time, Russian president Vladimir Putin attempted to coopt the Crimean Tatars – who have often spoken out against Russian interventionism in Crimea – by trying to reach out to their spiritual leader Mustafa Dzhemilev. Having failed to achieve his goals, however, Russia has moved towards an offensive strategy, in an attempt to silent dissent through intimidation. As explained by Andrew Wilson of University College London, the Russian authorities are following a “divide and rule” policy to “disable challenges to their power.” To this end they have established partnerships with alternative institutions that they can control: the resuscitated religious Muftiate of Taurida and the artificial Uncle Tom party Milliy Fyrqa. After the annexation, the West formed a united front. The United States, among others, refused to recognize the electoral results of the March referendum. A first and second round of sanctions against Russia were enforced. G-7 countries decided to suspend G-8 meetings with Russia. As life gets tougher for the Tatars of Crimea, however, no leading Western politician has spoken in their support, despite the warnings of Human Rights Watch, the Council of Europe and the Carnegie Endowment for International Peace. The West often engages in selective moral outrage in the international arena – and Crimea is an example of it. Inalienable rights are defended and abuses denounced only when the issues at stake fit within a country’s political agenda. In this respect, Crimean Tatars, who only constitute 12% of the Crimean population and have no immediate role to play in international affairs, are not seen as a priority. Wilson confirms that there might also be an element of reticence in speaking in favor of a Muslim minority, especially while the U.S. is engaged in its own fight against the Islamic State. Even Turkey has ignored its close links with the Turkic Tatar community, afraid to damage the country’s relations with Russia. Meanwhile, the West is failing to identify how the issue could have implications beyond Crimea. Russian affairs expert Mark Galeotti points out that the radicalization of Islamic elements within the Crimean Tatar community is a possible scenario, while Dzhemilev warned that some militant Crimean Tatars are already fighting in Syria. The possibility, however remote, that a hotbed for radicalism linked to the Islamic State might develop in Crimea should be at least carefully considered. In 1979 historians William O. McCagg, Jr and Brian D. Silver described how the exiled Crimean Tatars hadn’t been able to attract the attention of the West. Today, the situation might be repeating itself. The West should take a stand, be it because of its moral code or more pragmatic concerns. As noted by Galeotti, passive resistance is the only outlet currently available to the Crimean Tatars. The hope is that feeling the support of the outer world will galvanize their effort.